yesterday i presented a chapter of my senior thesis to a classroom of students and a number of professors. i find i am wracked with anxiety days before a public speaking engagement. writing, for me, is comfortable – not because it is easy (it is HARD), but because i have a method for doing it. after years of practice and feedback, i’ve found my sea legs. speaking is different. debate teams and student government are elective positions – speaking instruction is not mandatory. what we don’t know, terrifies us; public speaking combines our fear of the unknown with our fear of judgment and ridicule. no wonder it induces nausea in so many. take a very deep breath before starting to speak. keep a glass of water on the lectern (if your throat gets froggy, as mine does). people read two pages of 12 pt., double-spaced text every 5 minutes – plan accordingly. writing and speaking are completely separate beasts, even though they use the same language. the president has a speech writer for one task and a copy writer for another. when taking notes for presenting, try write as you speak, not as you write. It’s no new discovery that our generation says “like” an awful lot. Even though parents and teachers hammer it into our heads that using “like” makes us seem shallow and incompetent, we just can’t resist. Although we interpret these likes in a multitude of ways when we’re participating in the conversation, when we’re observing the conversation, we tend to write them off as unnecessary fillers, unconscious placeholders for the words we can’t think of fast enough. They’re useless, meaningless, and just get in the way of speaking properly. But — what if they’re not? Any Speaking Fellow will tell you that using likes is more of a science than you might expect. But, it always helps to get that point across when the New York Times writes an article about it. You like, smarty-pants, you! Barnard may have one of the best feminist zine collections in the city, but this past Saturday the 2012 NYC Feminist Zinefest surely surpassed that little shelf in the Wolman Library. A showcase of visual artists, poets, journal writers, social critics, comic writers, and other feminists who write and publish zines, the Zinefest featured a wide array of zine authors – but all with a feminist bend. According to the Zinefest’s website, a zine is “like a small, pocket-sized emissary of ideas.” It is a medium that puts us in touch with the contemporary feminist discourse outside of academia and outside of the world of publishing – it is the blog before its time and the last of modes of expression in print in our digital age. And after all, what could be more feminist than an open forum for fellow voices in the artistic, literary, and activist world? If you’ve ever had an internship in media, chances are that you’ve experienced the joy of transcribing interviews. After spending hours transcribing an interview the other day, I started to think about how the interviewer and interviewee were speaking–how they often started a sentence, paused, and then went in a different direction; how that pesky “like” inserted itself even in the speech of mature adults. Their speech seemed strange to me when I saw it in written form on my word document. It was less structured, less formal, but also more natural. This relationship between speaking and transcription reminded me of a student I recently worked with in the Writing Center. She claimed that she could easily and eloquently describe her argument and ideas out loud, but could not write them. This observation was accurate to a certain degree. She was not a “bad” writer as she claimed, but I found that her spoken ideas were clearer and more concise than her written ideas. I wondered what would happen if she recorded herself, and then transcribed her own ideas. Would this clarity in speech translate in an essay? So, I have a challenge for those of you who are more comfortable speaking your ideas than writing them: record yourself, listen, and transcribe. See if your writing comes more naturally when it is connected to your speech. It may seem silly at first, but you’ll never know until you try. Sometimes you have no idea what’s in your head until you say it out loud. After reading excerpts from Richard Lanham’s Revising Prose, I realize that I succumb to The Official Style: I use grandiose language when a smaller, simpler word would suffice because I like the cadence. The Official Style makes me seem smart even when I am unsure of my argument and/or evidence. Lanham’s image of “The Official Style seizing its prey like a boa constrictor and gradually squeezing the life out of it” resonated with me. It also concerned me. A meeting with my Critical Writing professor this semester caused me to reflect on my writing habits. I resolved to change them. I had an art history essay due and while writing, I decided to avoid the Official Style. It was difficult and I was not pleased with the outcome, but I handed it in anyway. Perhaps it was a bit reckless to experiment on an assignment, but I am excited to see how it is received and how it compares with the other essays I have written. In the past I have viewed the revision process as linear. I revise as I write, unable to move on to the next paragraph until I am satisfied with the current one. After I finish my conclusion paragraph, I take a break from the essay and return to it refreshed. I rewrite my thesis, delete unnecessary sentences, change words, and rearrange paragraphs. This process is done from the beginning of the first paragraph until I reach the last sentence of the last one. Then I print it. With my experimental art history essay, I wrote a draft of my essay, not stopping to analyze my word choice or syntax. I just filled the pages with my ideas, even those I wasn’t sure about, until I had a draft. As Donald Murray states in his article “The Maker’s Eye: Revising Your Own Manuscript,” “when a draft is completed, the job of writing can begin.” I hated my draft and considered starting completely anew. Instead I decided to revise it in cycles, which Nancy Sommers views as the best method for the revision process in her article “Revision Strategies of Student Writers and Experienced Adult Writers.” By focusing on different aspects of writing with each cycle, the language, argument, and flow of my essay received my undivided attention. The problem with a cyclic revision process is that it is never ending. I revised my essay for two weeks and with each revision I had no idea whether my essay was improving or getting worse. The essay I handed in looked much different from the first draft (and the second, third and fourth ones too). Perhaps I was too critical of myself and my writing, but perhaps I was not critical enough. The final draft was not final, it was abandoned. Most of you have heard by now about the Tucson book ban – the Tucson Unified School District’s removal of seven books from the State’s curriculum. Among these books are Critical Race Theory, The History of the Mexican American Civil Rights Movement, Pedagogy of the Oppressed, and Rethinking Columbus. 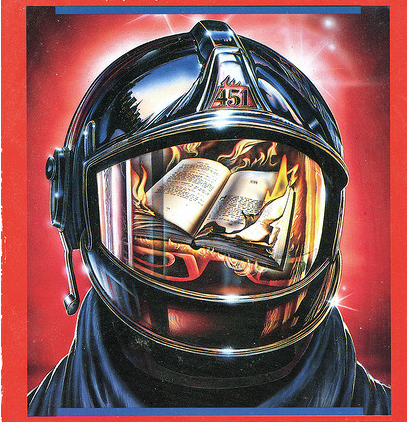 I don’t know about you, but I’ve been openly opposed to book banning since about 9th grade, when I first read Fahrenheit 451. Even Mein Kampf has literary value as a record of the reasoning behind one of the most evil minds of modern times. See also this video of Noam Chomsky, famed linguist, philosophy, and self-proclaimed anarchist, on the banning.